Pizza Grand Prix Six: The Final Cut? Updated details and developments will be posted on – Columbus Underground and/or look for updates on Twitter @CMHGourmand. Wild Goose Creative, Columbus Underground and CMH Gourmand join forces again for round six of Pizza Grand Prix. This edition will offer the usual assortment of the best pizzas from Columbus. We will also see a repeat of the judged homemade pizza competition. The baker of the best homemade pizza pie wins an apron from Made by Amy D. There will also be prizes from Red Gold Tomatoes for all entries. Homemade pizzas will be judged on Taste, Appearance, Crust and Creativity. Contestants for the homemade pizza competition should contact me at: CMHGourmand@earthlink.net by November 5th for additional details and should to plan to show up at Wild Goose Creative by 5:45 pm on Pizza Day. Pizza Grand Prix is a giant pizza potluck. The price of admission (for two) is a medium or large pizza from your favorite pizza shop. Bring a pizza to share then spend the rest of the night trying pizzas from all over town. For those that missed PGP I – V, see the links below for history and background. If you are looking for suggestions on a pizza pie to port to this party – I have some options for you: CMH Gourmand Pizza Picks. We can expect a variety of toppings and styles. There is a section reserved for vegetarian pizzas. No one goes home hungry. 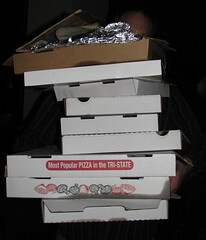 People are encouraged to take leftovers home at the end (bring your own tupperware for when last call is made at 7:59 PM) because we don’t want any precious pizza going to the dumpster. I think this is among the best low cost events in town and others agree – PIzza Grand Prix was voted best Columbus Underground event in 2009. I hope you have an opportunity to go. Wild Goose Creative is a great partner and the perfect venue for this pizzapalooza. The diversity of pizza selections can not be beat, you can expect some phenomenal pies. If time and circumstances allow pizza judge Dave may whip out a few pizzas from his modified Weber grill – no promises yet – but if it happens – you do want to be there. and is open to all ages. So the subtitle of this post is “Final Cut”. Pizza Grand Prix has always exceeded my expectations. But like any franchise or series of sequels, I wonder how long a good thing can sustain itself. I worry that this could become the next Police Academy 7 or Halloween 17 so we may pull the plug on PGP while on top instead of melting down over time. We will see what happens.